Awareness Week of 2018 was a huge success for the IWL in raising awareness for women’s issues. 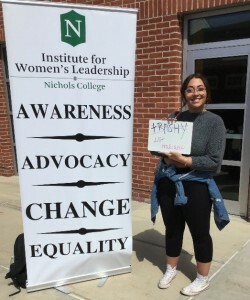 Events were hosted throughout the week around campus to highlight and bring awareness to issues such as body positivity, the gender wage gap, stereotyping, and gender equality. 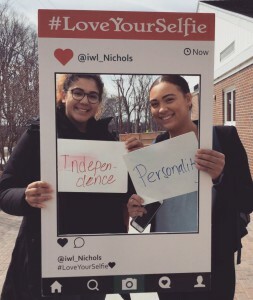 The participation of the Nichols College community enabled the IWL to raise over $500, of which all proceeds were donated to Girls Inc. of Worcester. 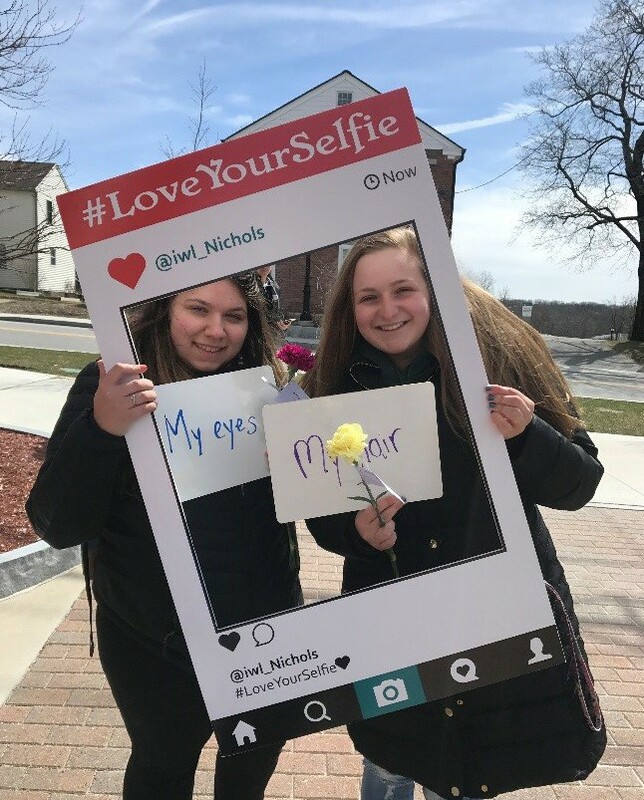 This would not have been possible without the assistance of the IWL Panelists in putting on these events or the Nichols students, staff, and faculty in participating. Awareness Week is based around National Equal Pay Day, which occurred on April 10th, symbolic of how far into the year women must work in order to earn what men did in the previous year. 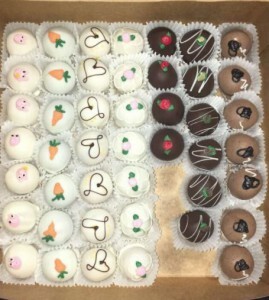 The IWL hosted its Equal Pay Day Bake Sale as part of Troublesome Tuesday where men paid $1 while women paid 75 cents to underscore the impact of the wage gap. The week began with Flowers for a Cause, part of Movement Monday. 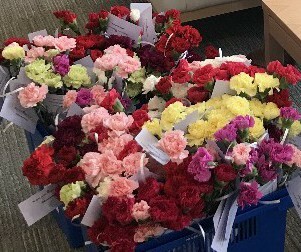 Flowers with motivational messages were distributed to students, who were encouraged to pass them on to someone in need. Four social media campaigns occurred throughout the week. The first of which was the #LoveYourSelfie Campaign, part of Movement Monday. 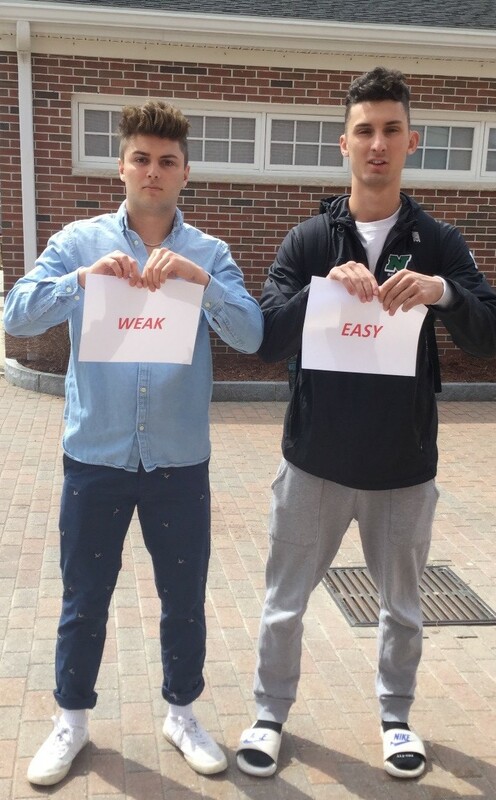 Nichols students were asked to write what they like about themselves on a whiteboard and pose with the Polaroid instaprint. 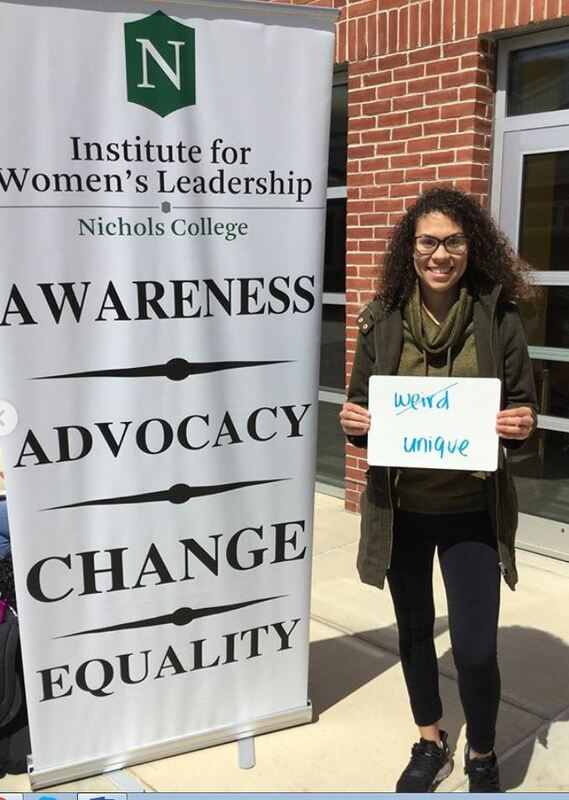 Nichols students were asked to confront the offensive things they hear on a daily basis by writing a racist or sexist label they face and redefine themselves with the #InTheirOwnWords Campaign, part of Wednesday Words. 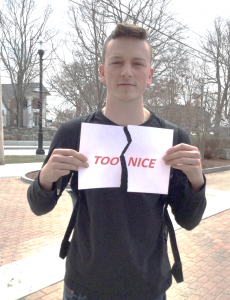 Through the #TearingItUp Campaign, Nichols students were asked to tear up words and phrases that perpetuate stereotypes, for Thursday Thoughts. This campaign focused on generating awareness of the stereotypes that exist, fostering a commitment to not use the language, and facilitating a conversation about why. 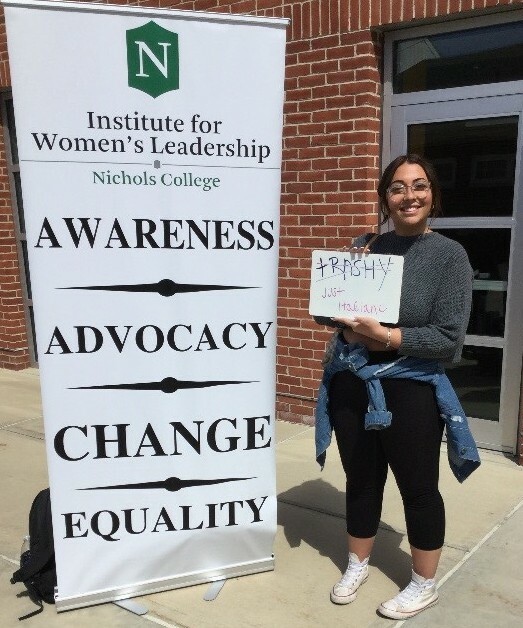 For Friday Feels, Nichols students were asked to pose with a board on which they wrote the name of a female who influenced them in order to heighten their awareness of how the gender gap affects those they love through the #WhoInfluencedYou Campaign. 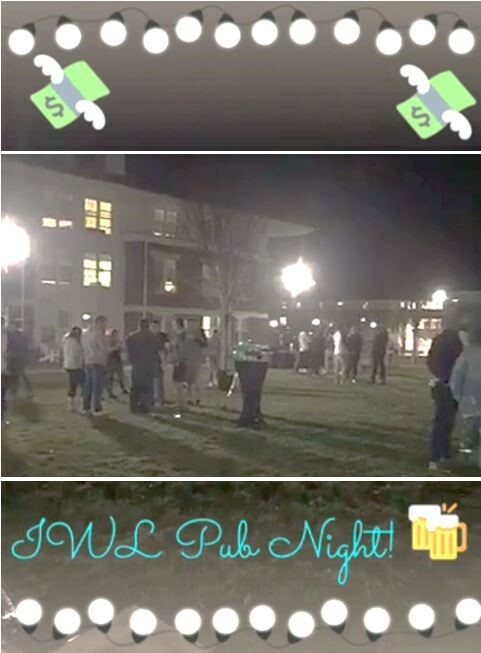 As the closer to Awareness Week, the IWL hosted its first annual (Un)Happy Hour Pub Night where men paid a $1 cover while women paid 75 cents to illustrate the gender wage gap. 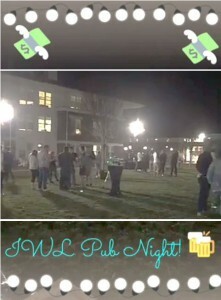 The night included live entertainment, hors d’oeuvres, a raffle, silent auction, and IWL giveaways. Students were asked to wear black to stand in solidarity with our sisters and say #timesup on the imbalance of power across all industries. 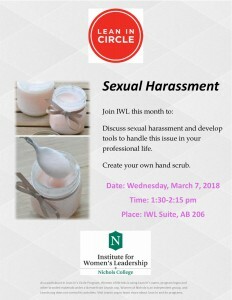 The IWL is looking forward to another successful Awareness Week next year. Keep an eye out for our next post, recapping the semester from our Student Advisory Panel’s point of view! Email reminders with details will be sent to students prior to each event. Any questions, please email iwl@nichols.edu. 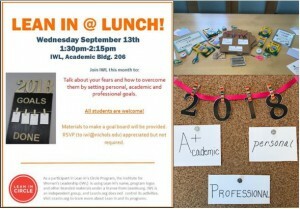 Campus invite to stop by the IWL for refreshments and to learn more about the IWL’s activities and plans. Student are welcome to join the IWL on a trip Blackstone Valley Cinema de Lux tin Millbury to see The Post starting Meryl Streep, keynote speaker at the Massachusetts Conference for Women. Katharine Graham (Streep) is the first female publisher of a major American newspaper — The Washington Post. With help from editor Ben Bradlee (Tom Hanks), Graham races to catch up with The New York Times to expose a massive cover-up of government secrets that spans three decades and four U.S. presidents. Together, they must overcome their differences as they risk their careers—and very freedom—to help bring long-buried truths to light. Monthly meeting for the 2017-2018 panel to plan. Conversation Projects are gatherings where students have the opportunity to meet and network with visiting professionals in a comfortable, conversational setting. Guest: Brittany Wagner, motivation expert, Last Chance U star. In collaboration with the Center for Student Involvement. Guest: Pam Borton, leadership coach, D1 basketball coach. In collaboration with the SMGT Department. 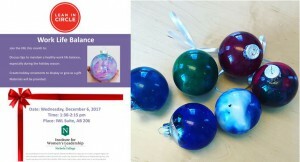 Monthly gathering for learning, connection, and motivation with female staff and faculty in a supportive, open environment. Nichols student volunteers mentor a group of middle school age students on goal setting for their future. Held at Grace Academy in Hartford, CT. Opening of the Winter Olympics. Highlighting the difference between men’s and women’s events. Why you don’t have a date on Valentine’s Day: highlighting offensive pick-up lines used toward women and raising awareness of how to avoid using them. Topic: Group Think-tank; Activity: Bring a male counterpart to discuss how poverty affects men and women differently. Highlighting the wage gap that exists for black women. As a part of Black History Month. A fashion show for students to understand and find clothing to fit the business casual model. Put on by Ann Taylor Loft of Millbury. Guest: Tori Sadler. CEO & designer of TORI NICOLE® hand bags. Via Skype. A film will be shown in the IWL Suite. Light refreshments and snacks will be served. 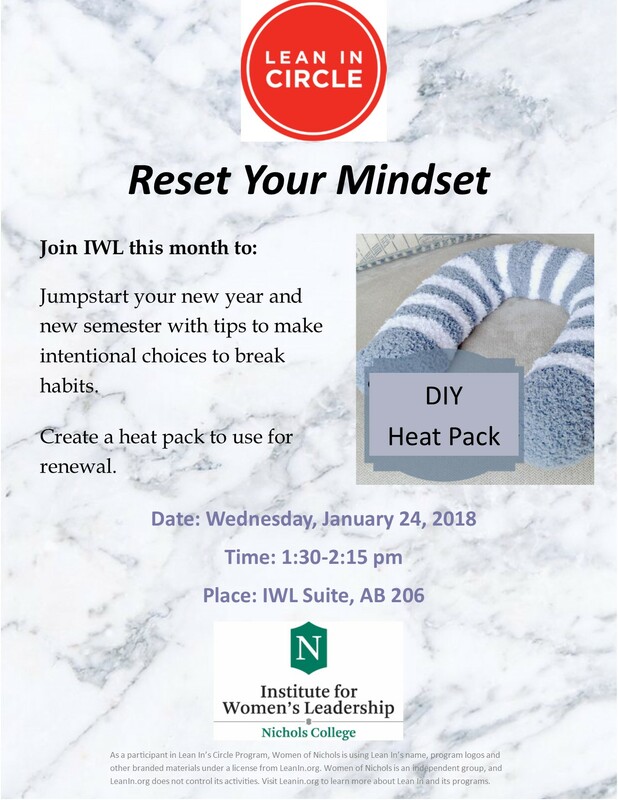 Prospective accepted female students are invited to dinner in the IWL Suite during their overnight stay on campus to learn about the added resource available to them. Nichols student volunteers spend the day mentoring a group of high school juniors on: the college search and application process, as well as transitioning from high school to college. Nichols student volunteers spend the day mentoring a group of high school age students on setting goals for their future. Nichols presents its 8th annual conference, welcoming professional women in the region for networking, skill building, and inspiration. Visit empowering-women.biz for information. Registration required. Planned in conjunction with other departments on campus, students apply to be part of a day of professional development and brainstorming. Designed to bring together student leaders from a variety of areas on campus. Speaker: Kelly Shannon. Ms. Shannon will discuss her new book, U.S. Foreign Policy and Muslim Women’s Human Rights. Her talk will address contemporary U.S. relations with the Muslim world, particularly how Americans gradually identified women’s human rights in Islamic societies as vitally important to U.S. foreign policy. This lecture is co-sponsored with the Fisher Institute and is part of the celebration of Women’s History Month. Hosted by professors Mike Neagle of the History Department and Boyd Brown of the Criminal Justice Department. How far have we come or not come as a society related to the positions of power and sexual exploitation dynamic? What are the implications for the current society-wide heightened awareness of systemic abuse among industry leaders? Guest: Shahira Gmira. Head of the Newton Mosharafa Fund—a £50 million, seven-year science and innovation partnership between the UK and Egypt—at the British Embassy in Cairo, Egypt. The Fund brings together the British and Egyptian scientific research and innovation sectors to find joint solutions to the challenges facing Egypt in economic development and social welfare. Via Skype. In partnership with the American Association of University Women, female Nichols students will be trained in assertive, respectful salary negotiation techniques, in an effort to help decrease the gender wage gap. Dinner will be provided. Limited seats; registration required. Highlighting sexual assault nationally. Wear denim to show your support for survivors. Guest: Nichols College President Susan West Engelkemeyer. Events highlighting women’s issues focusing on the gender wage gap and demand equal pay for equal work for Women. Based around National Equal Pay Day on April 10th. National Equal Pay Day is symbolic of how far into the year women must work to in order to earn what men did in the previous year. See next page for more details. Speaker: Selma Inocência. A journalist who received two honorary mentions under the National Press Award, a national journalism award, and won two international awards from CNN (2011 and 2013). Ms. Inocência’s career interests include international civilian peacekeeping. She is an experienced TV anchor/producer and journalist. Selma has been the Media Specialist at the USAID Mozambique Media Strengthening Program, training more than 50 universities’ students to be better journalists. In collaboration with Professor Marcus Goncalves, the IBUS, HIST, HUM, and BCOM departments and the Fisher Institute. 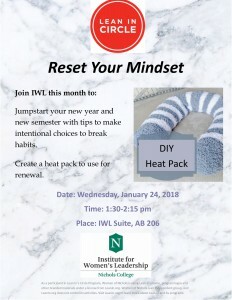 Monthly gathering for learning, connection, and motivation with female staff and faculty in a supportive, open environment. 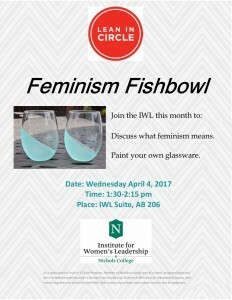 Male faculty are welcome. Faculty and staff are invited to bring a guest of the senior class for a cocktails and hors d’oeuvres reception. Questions about women in business, the pay gap, and diversity in general and will be distributed campus wide Monday and Friday. It will be anonymous and assess our overall awareness as a community before and after awareness week. Generated by the IWL Advisory Panel. The kick-start to awareness week, keep an eye out for statistics around campus highlighting women. Flowers with motivational messages will be distributed through the student population. Feel free to pass on the message to someone in need. 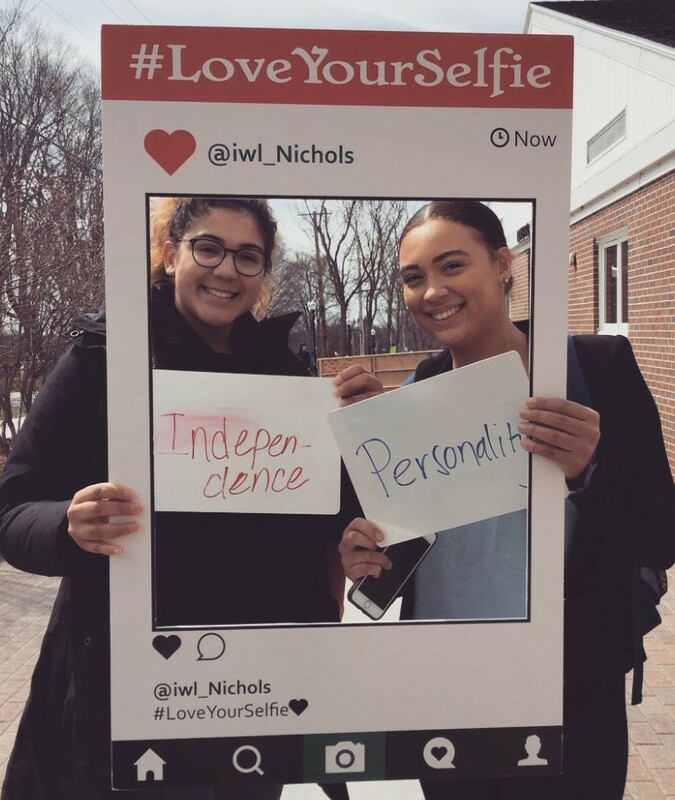 Nichols students will be asked to write what they like about themselves on a white board and pose with it for a Polaroid instaprint. Participants will receive Panera and IWL giveaways. National Equal Pay Day, symbolic of how far into the year women must work to in order to earn what men did in the previous year. Wear red to symbolize how far women and minorities are “in the red” with their pay. A nationwide awareness event where men will pay $1 while women will pay 75 cents – to underscore the impact of the gender wage gap. All proceeds will be donated to Girls Inc. of Worcester. 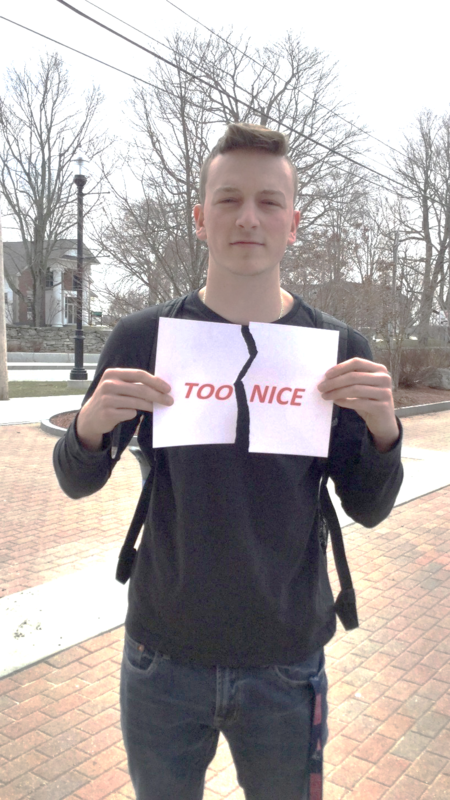 Women of Nichols will be asked to confront the offensive things they hear on a daily basis by posing with printed posters during this public event. They will write a racist or sexist label they face and redefine themselves in their own words. Participants will receive Dunkin Donuts and IWL giveaways. Come and support the women of the Nichols College Softball Team. The first 25 attendees will receive IWL giveaways. 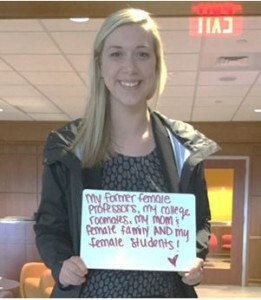 Men of Nichols will be asked to pose with a board on which they write the name of a female who influenced them in order to heighten their awareness of how the gender gap affects those they love. Participants will receive Dippin Donuts and IWL giveaways. A nationwide awareness event where men will pay a $1 cover while women will pay 75 cents – to underscore the impact of the gender wage gap. All proceeds will be donated to Girls Inc. of Worcester. Entertainment, light hors d’oeuvres, and IWL giveaways. Wear black to stand in solidarity with our sisters to say #timesup on the imbalance of power across all industries. For more information @TIMESUPNOW, @timesupnow. Lean In Circles are monthly gatherings offering motivation, learning, support and connections with other female students in a supportive, open environment. Lean in Circles are held worldwide with women of all ages. The idea was based on the book Lean In by Sheryl Sandberg. In order to appeal to our audience of college students, we have paired an activity with our topic of discussion. We’ve found this has promoted our attendance and fostered the discussion. Last Semester we held four Lean In Circles. 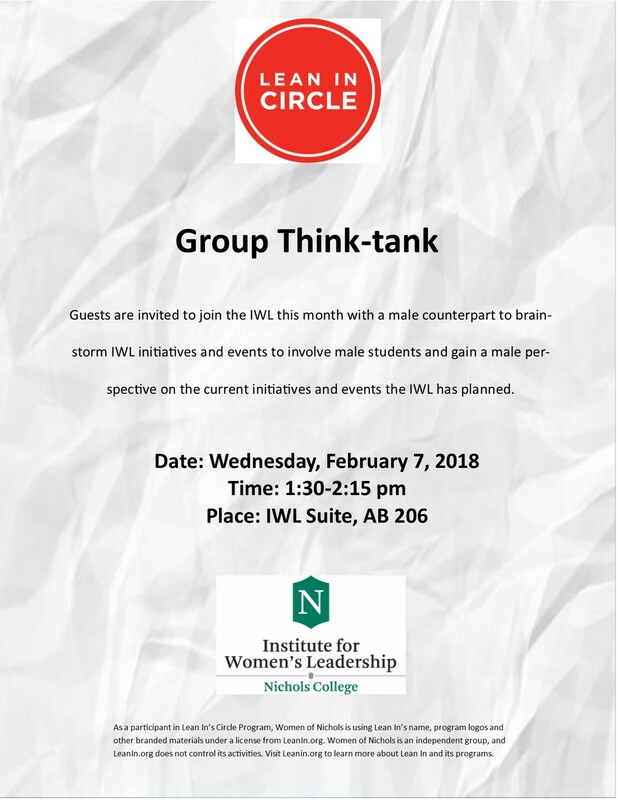 Panel members were invited to bring a male counterpart to brainstorm IWL initiatives and events to involve male students and gain a male perspective on the current initiatives and events the IWL has planned. This semester we have an additional four Lean In Circles planned. 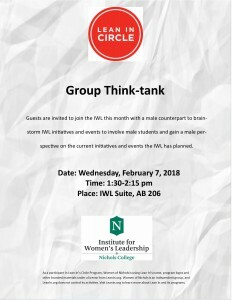 Female guests are invited to bring a male counterpart to brainstorm IWL initiatives and events to involve male students and gain a male perspective on the current initiatives and events the IWL has planned.